Is investors’ money where their mouth is? It is well known that moods, fear and greed drive the markets. So a number of “sentiment” indicators have been developed over the years, in an attempt to measure the mood of the market. There are indices like the VIX, which try to measure fear or greed on the basis of option premiums. Other sentiment indicators are based on weekly or even daily polls. But the problem with the latter is that we don’t know whether the polled investors have acted on their own feeling. An investor might feel mildly bearish, but that doesn’t mean he has sold already. Another investor might be bullish, but maybe he is still waiting for a pullback to do his buying..
Another problem is that not every investor is swinging an equal sized portfolio. A small retail investor might have $20,000 in his account, while a larger investor may have a few million to work with. Both will be getting one vote in the investor sentiment poll, but clearly their influence in the market is of a different magnitude. It would be a lot better if we could measure whether investors are putting their money where their mouth is. But how to do that? What does this chart tell us? Well, we would expect to see investors take more risk (more margin debt) when they are bullish and optimistic, while reducing their risk when they are bearish. Indeed, we see that margin debt bottomed at 15% during the 2008 financial crisis. It was lowest in October, well before the market finally bottomed out in March 2009. This means that Interactive Brokers customers were buying at the bottom. We also see that margin debt peaked out at 40% in April 2011 and has since come down to more average levels, even though the market has continued to go to new highs. Interactive Brokers typically serves more experienced investors who trade frequently and want access to a lot of different markets worldwide. Their average customer has about $170,000 in his account. While it is good to see what the somewhat more sophisticated clients of IB are doing, it would be even more interesting if we could see the same data from brokers that serve the small retail investor. 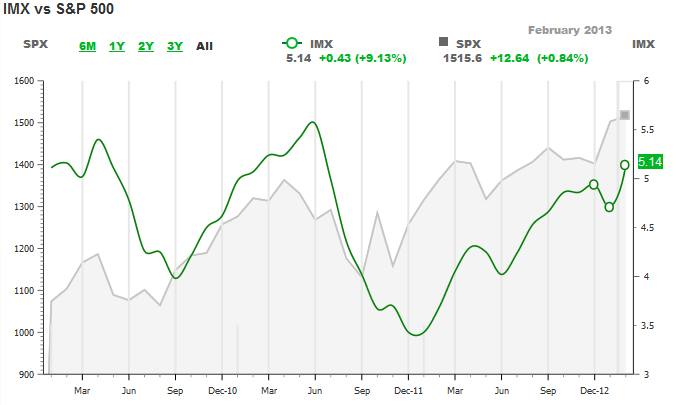 This index claims to be based on their customers market exposure and activity, but as we can see, the peaks and bottoms in their IMX (green line) seems to lag the highs and lows in the market (grey line) by one or two months. Which should not surprise, since TD Ameritrade is popular with small retail investor, who have an average $100,000 in their account. Small retail investors have a history of being late to the party, and this chart tells us that small investors are getting rather optimistic right now. It also gets interesting when we see divergences between what IB clients are doing and what this IMX indicates. For example, while the IMX made its largest one month gain in February, the IB clients have slightly reduced their exposure to the market since last January. This suggests that distribution of stocks to the broader public is underway, and that’s a warning sign. Distribution can go on for a while, but the longer it lasts the more painful it ends. So, I am keeping an eye on both these indicators and will keep you up to date via this blog. Is the Stock Market Headed Higher or Lower?